Dungeon and Dragons: Why don't we have Dn'D clubs in school? Disclaimer: It has been a long time (20+) years since I have played D&D and have just started my first campaign since then this past June (2015), relearning everything. Please do not assume that I am extremely experienced. The majority of my Dungeon and Dragons gaming experience is in computer based D&D and rpg games, as well as D&D and rpg board games. The dungeon my party is currently exploring. We have a lot to uncover. I am loving my Dungeon and Dragon (D&D) group. Every Monday (depending on availability) I met up with my sister, and brother-in-law at their house, while our friend in Kitchener Skypes in over the Xbox One. We play for an hour to an hour and a half each time. Long work days, and early mornings combined with all of us not getting any younger, has made our time together brief, but still a lot of fun. We laugh at our misadventures, and bite our nails as we encounter beasts that bring us close to death. My brother-in-law enjoys his role as dungeon master, planning our encoTunters with glee, as we build our character back stories and skills, adding details to our narratives and trying to be entertaining in our descriptions of our actions. I have been trying to find what works best for me in tracking my character and the story. So far I am balancing the use of a notebook and a couple of phone apps to keep track of my character stats, spells (I am a Bard) and the story thus far including drawing maps based on the DM's descriptions. So far he (the DM) finds my maps laughable, but I am getting better. I love my bag of dice, and am having a difficult time refraining from buying more dice every time I enter a game store. When my teaching colleagues ask me what my plans are for the evening I proudly tell them I am meeting with my D&D group. Which often leads to questions like: "What is D&D?" and "What do you do when you play D&D." Depending on the level of interest I go into greater or lesser detail. Since my colleagues are all teachers I try to use language familiar to the classroom. The one common explanations I give being that D&D is a storytelling game where one person (the Dungeon Master or DM) establishes the setting and problems (quests) and the other players develop characters and try to come up with solutions to the problems. In my head I think of the dice as the agents of chaos that put obstacles in our way, but can also aid us in removing them. They are tools that help us exercise our thinking and actions. The more I try to explain D&D to other teachers, the more I see how it can engage students in play that is directly connected to the curriculum. D&D as an extracurricular club it would be a great platform for practicing skills taught in class. I have a feeling that playing D&D in class would take up a lot of time, be very difficult to assess, and possibly be a sensitive or controversial issue for some students; but imagine what students could consolidate, apply and practice if they chose to play on their own time? Just to name a few skills that would be engaged. I think I do not want to ever see D&D in the class. Even though I love it, I am afraid of what would happen to the spirit of the game when it is education-ified. I am afraid of it being appropriated by publishers who would turn it into an easy watered down version of what D&D really is, thus turning students away from the creative and organic world of Dungeons and Dragons. I don't want the fun to be leveraged out of it. That being said I already know of a few D&D boardgames that are user friendly for younger players, but I would like to also be able to use the 'real thing' too. I am interested in finding out is if there are any teachers who are already using D&D in their schools, what they have done to make it work, and what impact it has had. Imagine the impact of a game that encourages creative thinking and problem solving while building a community. Perhaps as I gain more experience (literally and figuratively) in my D&D group I will think of a viable way to begin a group in my next school (I am out of the classroom this year as a SWS Teacher). Time is always an issue at school. There is not enough time in the day to everything you want. Playing a game is often near, or at the bottom of the list. When do you play? How can you make play meaningful (curriculum connected)? Why does play have to me meaningful? I struggle with these questions, and others all the time. For example; if I make time during centres for play, but I also expect students to write about their play, does writing about play justify the time I give to playing, or just take away from the benefits of playing? Uno, Chess (not really a fast game), cards, Dominoes, Story cubes, Spot it, We didn't playtest this game at all. Almost all my games are easily found in book, games shops, and department stores. Spot it, and Story cubes are the current favourite of my class. These games are quick, and allow for many players. I have watched half my class choose to play story cubes and create the funniest, strangest stories I have ever heard. I have also used this in class as a fun oral activity, and a way to talk about units of organized thought i.e. paragraphs. Spot it is a favourite because it is fast paced and very visual. My ELL students in particular liked this one, as it does not require reading English text. The last game on the list is my favourite, because there is a lot of thinking, and luck in a 5 minute -or less- game. Students have to quickly read their cards and make a plan to ensure everyone else loses. My students in grade 4/5 are a bit hesitant to play 'We Didn't Playtest this Game at All' because it requires a lot of reading when you are first learning to playing it, but my former students who are in grade 6/7 do come by my class to borrow it occasionally. My latest game Duple I haven't yet introduced to my students. For now it is sitting on my desk, driving my students crazy. It is from the makers of Anomia. I can't wait to play. I have a few names that I have used repeatedly as I hop from one computer game to another. There are two names I use most often; both from my days playing W.O.W., but I have had other names in other games too. Most of my friends and family have one gamertag that they use consistently on their main characters of any given game, and secondary names or names that are a variation of the main on other characters. I am slightly jealous of this; that they have one universal gamertag that has followed them through all their role playing adventures. I have not done the same. I think I am just too picky and indecisive. Earlier in the school year, I decided that since my Minecraft Club members would be sharing my accounts, it would be a good idea to have them create a gamertag for themselves; to make it feel more like they had some ownership of their avatar. Since the Multi-School Minecraft Server has an add-on allowing people to change their names by typing: /nick, I figured this would be easy. Because I was doing this as a club activity, I didn't really plan out how I was going to teach the use of gamertags like I would have, if I was teaching a lesson in regular class time. That was the wrong choice to make. At the beginning of club time I had the students meet me at the carpet while they waited for their computers to log in, and spoke to them briefly about what a gamertag is, and how people often have one that they use across every game they play. I gave examples of gamertags of people I know and told a story about how my friend had reconnected with another friend she had lost contact with when she stopped playing Dark Age of Camelot. This friend saw an avatar with the same name her friend in Dark Age of Camelot run by her in the town of another game, and she was able to send them a direct message. Because of this they were able to renew their friendship. More importantly I spoke about gamertags can be one way of protecting their real personal information. I then gave a few examples of tags being used. I finished off by letting the club members know that they were to create their own gamertags for the next meeting in a weeks time. I got some good tags, but more than anything I got a lot of long, difficult to remember names that were impossible to spell or read. - Given different strategies for creating a name i.e. based on interests, fandoms, genres etc. - Practiced creating a gamertag with students i.e. if Harry Potter had to pick a gamertag what do you think he would use? Katnis? - Insist that students be able to spell their gamertag. For health I am covering online safety with a focus on cyber bullying. As part of the overall online safety unit I will actually try address creating an online persona through gamertag. Hopefully this will also lead into deeper questions and discussions about roles and responsibilities as a digital citizen beyond what we do in school. For example: does having an online persona separate from who I am in real life mean that I can behave any way I want? I have been thinking about this for some time. I was planning to see if I could find articles about digital citizenship as it relates to gaming, but I never got around to it. So I will just share what I think based on what I have heard from people, experienced, or connected to what I have read in James Paul Gee's book: What Video Games Have to Teach Us about Learning and Literacy. Yes I am being a bit lazy, but I'm okay with that. One of the arguments against children and youth participating in online gaming I hear often, is that these are not a safe spaces, due in part, to the language and attitudes to which they can be exposed. Anyone who has ever survived Barrens chat has experienced this pain and knows the truth of the above statement. Lots of inappropriate, racist, and disgusting things can often be found written on in-game chat boxes. And of course the same dangers in online gaming, as in any chat rooms. or social media exists: the risk of being approached by predators online pretending to be children. The world of online gaming can be scary, and there are mean people out there who use the anonymity of the internet to behave in horrible ways. Also, learning how to deal with 'bad/scary' people online is important because: ignoring trolls does not make them disappear. Everything I learned about playing video games offline and online, I did not learn at school. As I have mentioned in other posts, I grew up gaming, and my parents were always a part of my video gaming experiences. My first lan party was with my family playing Age of Empires. So, unlike most kids, I had adults, and some pretty responsible peers who shaped my online gaming identity. Have I ever camped a body in WOW? Sure, no one is perfect. Yet, for the most part I treat others the way I want to be treated, I am fair, and I can express my opinions without the use of vulgar language, ignorant slurs or outright hate. Having my identity as a gamer partially constructed with support from my parents who played with me, and who I watched play, made me a better online citizen. While my blog tends to target educators, I do not believe educators work in isolation from the rest of the community. It is not the responsibility of the school system alone to teach children how to be digitally responsible. All of us who are stakeholders in the lives of the children in our community have a part to play in supporting children as they learn to live in the real and virtual world. Gaming is one way that we can shape the attitudes children have when dealing with anonymous people in an unreal world. Skills that children will, no doubt, need when they are working, or interacting with others in the real world right now, and later in life. Trolls, bullies, grief-ers, and bad friends can be real or virtual. During ECOO 2013, after our session, +Liam O'Donnell, +Diana Maliszewski and I went to find a place to respond questions that were tweeted to us, and debrief. We were joined by @mswu who had questions about Minecraft and we had a great talk. Talking to people who are as passionate about gaming and digital literacy as I am, is the best part of ECOO. During our time I suggested that it would be helpful to facilitate connections to parents by having a parent Minecraft server. A place where parents who are adept at gaming could connect with parents who are less adept. A place where knowledge, strategies and experiences could be shared, and as a place to foster partnership between parents and the school to support our students. I thought, and Diana agreed, that this was a brilliant idea. As it turns out, this was not an original idea. At least one educator in the States is running a parent Minecraft server already. I don't really know anything more than the fact, that a parent server exists somewhere in the United States. I tried to find it, with little success, but I would really like to know more about what impact this partnership has made. I can construct lessons that cover expectations from a variety of the Ministry of Education for Ontario Curriculum documents. Lessons that have outcomes that include students learning digital citizenship skills. But what I do in class can be left at the door of the school at the end of the day. Building a partnership that lead to a common understanding, language, and expectation for digital citizenship in more than one domain is what will have the biggest impact. Gaming is more than just killing and 'Pwning N00bs'. The attitudes that develop in gaming can help, or hinder a player and may have an impact in real life. Monitoring online gaming may not be as 'easy' as monitoring digital social media, yet as messy as it can be, it can also be fun. You haven't lived until you have raided in WOW with your parents. This should be my ECOO reflection, but it's not. I may still have that reflection coming though, and honestly much of this post comes from my favorite time in any conference: the discussions that happen in between talks. Over the last week I have been thinking a bit about digital citizenship. Earlier I jumped in a conversation Andrew Campbell was having about it. My Twitter exp. is low and don't know yet how to say everything I want or mean in 140 characters or less -something anyone can see if the look at how long my blog posts are. I think he is right. We really do need to educate many parents on digital citizenship. It was one think to let children be raised by televisions, it is quite another to have them raised by computers and smart phones. (Not that I agree with child rearing by tv either). There are a lot of parents who need to learn more about how they can support their children as they access the Internet at home. Because even though they may have heard they their kids are 'digital natives,' they may not understand that the title does not mean that the have a a deep understanding of the space they move through. However, I also believe there needs be a common language and understanding established about digital citizenship in the schools too. There are a lot of educators with a vast depth and breadth of IT knowledge teaching about digital citizenship, and who are doing a lot to prepare our students for life in the cloud. But right now I feel that knowledge is more of a niche thing than a common practice. There are many educators who don't address digital literacy for many reasons, including; lack of interest, lack of professional development, the teacher librarian/computer teacher will do it. All this and/or they don't feel they have the tech resources to get to the place where they are comfortable professionally to be able to incorporate it into their classes. How are they expected to teach digital citizenship in a way that allows them to have students practice skills taught when access to technology is limited? Special mention: The TDSB Teaching and Learning ICT department has developed a great resource, the ICT Standards, that addresses digital skills and gives examples of how to easily connect them to the curriculum. They have also complied a database of teacher created lessons that connect with the ICT standards that other teachers can use in their class. Every year teachers volunteer to be on TACIT and create detailed lesson plans from actual lessons they have used with their classes and share them with the TDSB. It is a great resource for teachers learning about integrating ICT in their classroom and Learning about digital citizenship. Back to parents; it is dangerous to think that teachers are the only holders of knowledge about digital citizenship. There is an untapped market of parents who know a lot more than we give them credit for. Adults who work in IT fields for example. I know of one parent who has made a Minecraft server for his daughters. He and his wife (who are also big MMO gamers) actively monitor and instruct their children on appropriate use and behavior of digital technology. If their school were to host teacher-parent discussion (fireside chat) about digital literacy and citizenship they would be a wonderful resource for sharing what parents can do at home to make sure their children are safe and responsible. I think we need to give parents a voice in this discussion. We need to have an open dialog where we can learn from each other and construct solutions and strategies for supporting our students. This kind of partnership would not only support our students but also strengthen our relationship with the parent community as a whole. Losing Has Never Been So Much Fun! My sister and brother-in-law have purchased the game Pandemic and all the expansion sets to go with it. I have played it with them 4 or 5 times so far and we have not won yet., and I can't wait to play it again*. Pandemic, is a cooperative game of containing outbreaks and curing viruses/diseases. Players are given their roles randomly and then have to coordinate their efforts with the other players to beat the game together. The odds of winning are stacked against the players, and the gameplay can get quite tense as players try to manage outbreaks and get the research done needed to cure four different viruses. The reason I love this game is the same reason I enjoy so many of the games I play: the challenge. I have not won yet, and I will not give up playing until I do! And should I (we) actually beat the game, we can 'level up' by dialing up the intensity of the basic game, or add the expansions. No one strategy that you tried the game before will necessarily help you win the next game, because the game is always changing. There are a lot of elements you cannot control that will change they way you play. For example, how many players you have changes what you can do, and not being able to pick your role, but getting it randomly handed to you changes the strategy you use too. I have only ever played the same character twice, which was great, except all the other characters on the board were different. The most random aspect of the game is where and when outbreaks happen. You can only predict outbreaks to a certain degree, so you have to be flexible in your planning; two cards turned over could mean that you have to completely rethink the next 4 moves. It takes a lot of game play (or some research) to really beat the game. For my teacher peeps out there: I think it would be interesting to play this game with my grade 5 students during our human body unit. I wonder if losing would make them want to try again or give up. I hope they try again. But there are problems to overcome if I were to bring this to class like: where would I find the time for my students to play a game that could take up to an hour to play? What would the rest of my class be doing? what if it is too complicated for them to follow? I think I would be able to get some interesting reflections on how it feels to fail, and perhaps some -loose- connections to how stressful and challenging it must be to work in the various fields that deal with medical outbreaks. I could even connect it with social justice issues in regards to access of medication and health education in developing countries (and perhaps developed countries too). Who knows, I may be able to talk a few students into playing the game during a holiday party as a test run. (My class parties tend to be game based). *The last couple of games nights have been devoted to Lords of Waterdeep and Drizzt. When I started teaching 11 years ago I remember having to learn how to spell Beyblade because it was the subject of most of my grade 1 and 2 male students journal entries. I remember complaining about how obsessed they were with the toys and taking solace in the belief that 'this too shall pass.' This new vocabulary along with the Pokemon vocab. I had to learn was quite vexing for me. I am not a great speller to begin with and these strange new words didn't help. However, if present me had been able to talk to past me I might have been able to tell myself to take advantage of this obsession and use it to engage my students in Language and Mathematics. But at the time, as a first year teacher, I was more concerned with trying to cover everything in the curriculum while working on my classroom management, and knew very little about inquiry or about the power of play. Opportunity missed. I have just finished my last day of teaching summer school with the inner city program in Toronto. It was a short, but packed program. which. It was a shame that it was so short since the students from the 6+ schools that make up the summer school program have really started to connect and develop a summer school identity. One of my students confessed this morning that the only reason she is going to finish off summer school this week instead of taking the last day off as many students do, is because she wants to be with her friends on the bus. Maybe not the best reason for continuing to go to summer school, but it's a reason. However was not the bus drive that is the strongest thing that has united the students here. No, the biggest thing that students have bonded, the boys at least, was over is Beyblade. It started off with a couple of students in grade 2 bringing their Beyblades to school. By the beginning of the second week one student started bringing his stadium to school to play with, and the crowds grew. By the last week of summer school there were 3 different students bringing in stadiums to school and at recess and before school students would huddle together in large groups playing. I never learned how to play with beyblades so, and when was outside I would watch them play. It was a constant stream of beyblades being released and quickly retrieved or caught as they got knocked over, in or out of the stadium. I was having trouble understanding the rules of the game and asked the students how they know who the winner is. The players stopped for a brief moment to tell me -in slightly annoyed voices:"there are no winners, we are just playing." They looked at me like I had missed the whole point of the game entirely. Which I guess I had*. Every day I made a point of watching one of the groups for a few minutes to try and understand the appeal of the game. While they played some students maintained a running commentary of the action as well as engaging in a bit 'smack talk' along the likes of: "mine just owned!" and "mine destroys!" But they did not keep track of any kind of score. Before and after they played the would compare their toys; size, colour, and when or where they bought them and making plans for the next day. I asked some of the students huddled together what grade they are in, and in one group the range of grades was from grade one to grade five. It is a rare thing to see a group with that big of an age difference happily playing together at recess. After watching the boys play for a while I realized they were more interested in how their bayblades functioned and less about engaging others in their play beyond commenting on how awesome their own beyblade is. Their play looked more like parallel play, than cooperative or competitive play. It was like watching toddlers in a sandbox; they shared the same space and would talk, but not really engage in conversation beyond the narrative they were creating around their own toys. There was a lot of general shouting, but little actual dialogue between players beyond: "don't touch mine!" The only exclusions to the groups that I saw, was that no girls joined. I asked about this and the boys said that the girls just didn't want to play. I then asked if they would allow girls to play and got some mixed responses of yes and no. They did tell me that one girl (in grade 2 or 3) had brought a beyblade to school, but she didn't play with them, she just let them use it. One of the boys lead me to the girl and I asked her about it. She said it (the beyblade) was her brothers' and she wanted to show it to them (the boys) and let them play but she didn't want to play herself. I couldn't ask her more because recess was over and because I was afraid my questions might be a bit leading. Perhaps if I knew her better I would be able to find out more. 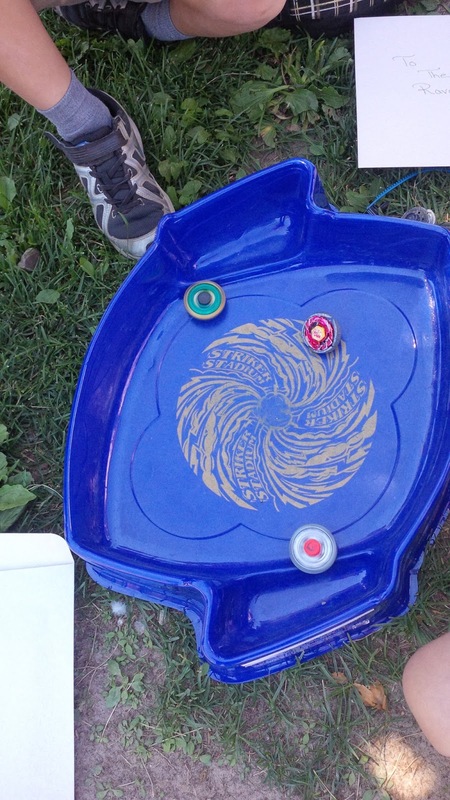 I had know idea that beyblades could have such a long life, nor did I realize how much knowledge students had around them or the way that it could help establish a connection across grades and schools. It was really interesting to talk to the boys playing and having them share their enthusiasm for what they were playing. Beyblades are not popular in my school any more, but is was obvious from my time at summer school that the fad is long from dead. I am sure if they do not remember anything they were taught this month, they will at least remember the fun they had at recess playing beyblade with other kids from different neighbourhoods. *I looked up the game, and according to Wikipedia the last top spinning is the winner. But these students kept picking up their tops and relaunching them, so that there was never a 'last man standing' situation. So I was right, there should have been a winner, but they had obviously change the game play to suit themselves.